You’ve played everything from an alien teddy bear to a limerick-spouting leprechaun. While writing Size Matters Not, did you ever finding yourself thinking, “I’ve had a pretty unusual career…”? Yes, I suppose writing the book did make me sit back a little and think about that. Because when you’re so closely involved in something, when it’s your career, you don’t really take that step back and think, “Wow, I’ve done some really exciting things”. The process of writing the book made me look at things from a different perspective – from the perspective of a reader. I had to think “Is this something people would be interested in reading about?” I was very careful not to include everything – some things I thought had no benefit or weren’t interesting enough. So I wanted to make sure that everything that went into the book was rich and had something to say, and wasn’t there to just fill out the pages. I was almost 40 when I started writing it, and had been acting for about 28 years. Throughout my career I’ve often recounted stories about Star Wars and Willow, but I thought, “These are just the bullet points”. So I started to think about what happened before and after that. It helped looking at old photographs, talking to my parents, people I’ve worked with, listening to certain music… All of those things helped me build a picture again. Yes, that was my work experience, which was great! I’d just got some rollerskates. Those two things went well together – there were long corridors at Elstree Studios and I delivered scripts on rollerskates! I can’t even describe it. Being 11-years-old and being given the opportunity to meet your heroes… For a kid, that was wonderful. Mark [Hamill], Carrie [Fisher] and Harrison [Ford] – though I saw them as their characters all the time rather than as actors! And then to walk onto another set and find a Stormtrooper… Wow! Just to be face to face with one was mindblowing. I don’t think I comprehended at that time the importance of what I was doing. I was just a kid having a fun – I was with my heroes and it was better than school! Little did I know it was going to be the basis of a career in acting and would shape my entire life. There aren’t many movies that people are interested in talking about many years later. There are plenty of films I’ve done that people won’t be interested in 30 years later! Leprechaun maybe (laughs). Yes, I was just a background extra basically. Though I was always getting featured. David Tomblin, the first assistant director, was a wonderful man and whenever he set up the crowd, he’d often put me at the front near R2-D2 or whoever. So I ended up being quite featured. I then become one of only six Ewoks to go to America and I had the opportunity to expand on that. Poor old Kenny’s misfortune was my fortune. I was called on to replace him in a scene and the rest is history. I was given the name of ‘Wicket’ after that. The early call sheets said ‘Kenny Baker: Wicket. 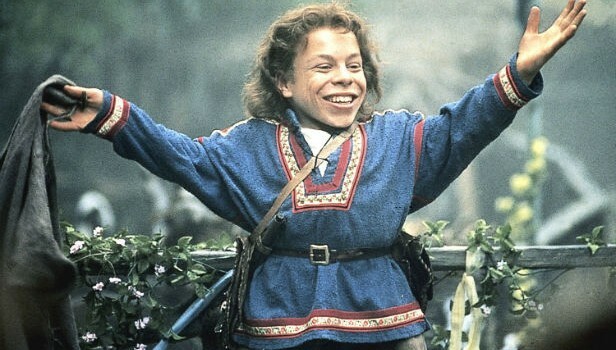 Warwick Davis: Warrick’. Then when the merchandise came out I became ‘Wicket W Warrick’. Do you still speak Ewokese or Huttese? Yeah, I remember [the Ewok war cry] “Yub Yub”. And “Lurdo” means idiot. I do have a dictionary of Ewokese from when we were doing the Ewok movies, so that I knew what I was saying. It’s quite a well thought-out little document! I can remember some Huttese [from The Phantom Menace in which he played W. Wald], but I’ve forgotten what it means! I had various lines, and the sound designer Ben Burtt recorded them all. It was like one of those language tapes where you learn Italian. I’d listen to it, and repeat it to get the pronunciation exactly right. Do you enjoy doing the convention circuit? My favourite part of events like that is the on-stage presentations – getting up there and talking to fans, hearing what they have to say. Star Wars fans are such great people. They’re so passionate about Star Wars, they’ve got a great sense of humour about it. And they hang on every word, every detail of something new. I’m hoping there are things that are new to people in the book, something they never knew. We discuss [the Ewok mockumentary] Return of the Ewok in there – something fans always talk about, yet is still shrouded in mystery. It’s something I’d have loved to have seen released. Lucasfilm looked at it many years ago as being a DVD extra, but I think the logistics of sorting everybody out contract-wise was so difficult. Nowadays if you do a film, you sign away your right to any behind-the-scenes footage, but back then those sort of agreements weren’t there, so you have to go through permissions. Return of the Ewok was never finished was it? Never finished, it was just 23 minutes long. That’s part of its charm. It was very rough, and some of the sound is only temporary… You feel like you’ve found an undiscovered treasure when you watch it. The 16mm print has been lost unfortunately, but it exists on a few VHS copies and it’s been preserved digitally. In the book I’ve got 32 frames of it, which go through key moments in the story. I wanted people to be able to visualise it. Your next big role was Willow. A lot of reports claim Val Kilmer was difficult to work with, but you give a very positive account of working with him in the book. Val to me was a warm, generous and fun guy to hang out with, and I spent many months doing that. He does get a bad press, and he can be unusual in his way sometimes – you never quite know whether he’s joking or not. Val likes things a very particular way, but some performers are like that – when they’re working on set they like some things to be just so, and if it isn’t, it can bother them quite a lot. Val has actually said to me, “What do I do? Why do I get such bad press?” He genuinely can’t understand why he gets reported the way he does. But he’s one of the very few reasons why I got through Willow and achieved what I did in the film. It was very physically gruelling and quite demanding, and Val was always there with a joke and to be supportive. It was kind of like me and him and Joanne [Whalley] against the rest; we all stood together, and Val was full of great acting tips. Even auditioning with him there was this immediate connection, this Odd Couple style chemistry. I’d love to work with him again. When he’s over in London we keep in touch and we fall back into the days of Willow. Were you disappointed that Willow didn’t go on to become a franchise? In one way in that I’m disappointed for the fans. I mean apart from “Is there going to be another Leprechaun movie?” Or “Was it hot in the Ewok costume?”, the question that fans ask me most is “Is there going to be a Willow 2?” I did put that last one to George once. They had discussed a television series – it’s quite a good idea as television isn’t seen as the poor relation to movies anymore, it’s seen on a par and can achieve different things. So I think that could work well, and Lucasfilm do produce some wonderful television. George said they thought about it, but nothing came of it. I’d love a sequel. But it’s got to come from George you see? George won’t accept scripts from elsewhere, he’s in the driving seat. Write to George Lucas and ask him – I keep asking him! From an artistic perspective, it would be nice to visit the character again. He’s older but is he wiser or a better sorcerer? I don’t know whether we’d need to follow the books that were released, but I’d just be interested to see how the baby grew up and what happened to my character. How involved was George Lucas on the set of Willow and Return of the Jedi? He was pretty involved on Willow. He was Ron Howard’s right hand man, there to answer any questions. He oversaw a lot of the special effects stuff – that was his area of expertise, he knew what was possible. He also knew how far he could push ILM at that point, he loved to give them a challenge. He’d say, “Let’s shoot it this way and let them figure it out.” He directed a little bit on a different unit on Willow, and at other times he’d be hanging around on set – sometimes messing about! We once got told off by Ron because we were messing about having a water fight. Ron shouted at us! I don’t think I saw George that much on Return of the Jedi when Richard Marquand was directing. He was about, but I don’t remember him being influential in anything I did at least – though I’m sure he was influential in the way the day’s footage was used and what Richard was doing. I wonder – and I’ve never asked George this – how much of an influence he had behind the scenes on what I was doing. Were there things being said like “Make sure you get Warwick in there”? I don’t know. You’ve worked on low-budget movies like Leprechaun and Small Town Folk and big-budget ones like the Harry Potter franchise and Return of the Jedi. What differences have you found between them and which do you prefer? The main difference is the time it takes, the pace that we shoot at. On a lower budget movie it’s relentless and fast paced. You’ve got to go through many pages of script in a day just to make the schedule – which can be anything from a few days to a few weeks. On a big-budget film, time is important, but you don’t expect as much from a day, you may only do a page or two of dialogue. It’s like a big, lumbering tank as opposed to a radio-controlled car on a low budget film. You still get the job done, but it’s totally different. I know. I almost feel bad about it, but you have to be honest and I wanted to be. Because no one ever asked me about it particularly, I’ve never felt inclined to talk about it particularly, and out of all the films I’ve done it’s the one that always gets forgotten. It is a shame because I think it was a wasted opportunity for a franchise; it’s a good character, it’s a good concept, it had a great cast. It was purely a badly managed production, and it suffered as a result. But working with Ron Perlman and Stephen Moyer was great – it was shame for them. I did one day that lasted 21 hours – a day shoot that went into a night shoot as we were so behind. It was sunny when I started and then snowing on Snowdonia at night when I finished! It was tortuous. The majority of your work has been within the fantasy and horror genres. Do you ever feel typecast? Well, I am typecast to a certain degree, as my size lends me to playing goblins and strange characters in these worlds. But I get to perform and I enjoy doing that. It’s often quite interesting to transform yourself; you get to be a chameleon. So it’s really challenging and interesting from an acting perspective, whereas films that are straight period dramas you’re just creating another person. Though I would love to do that as well as there’s nothing worse than sitting in a make-up chair at four in the morning! But I don’t feel typecast, I just feel grateful for the opportunity to work in any film. And I enjoy watching sci-fi and fantasy. Going to the movies for me was about escaping as a kid, and it still is now. I love to be taken to another world and taken on an emotional journey, and then taken home again when I walk out. I don’t enjoy going to the cinema and being reminded of the horrors that are not that far down the road. I like to escape. You mention in the book that you used to make short films as a kid. Would you like to turn your hand to directing a full-length movie? I would like to. Directing is more like collaborating, taking your actors and working as a team to create something. I don’t subscribe to that “You stand there, you go over that and do that” style. I think it’s a team effort, and everyone should workshop it. That’s how I’ve worked when I’ve directed some shows for theatre, so I suppose I would apply the same thing to film if I were to do it. But I couldn’t be in it as well – I don’t think I could act and direct, I’d need to do one thing or another. I’ve learnt a lot about directors and what makes a good director. Ron Howard is a great communicator, and the fact he was an actor helps him. He knows what to say at the right time. You have to establish a good rapport with the actors. Like myself and David Yates when we’re working on Harry Potter – he’ll just look at me after a take, and I’ll know if he’s genuinely happy or not. That’s what you need. As well as acting you also run the agency Willow Management for short and tall actors. Why did you decide to set that up? It was a gap in the market really. My father-in-law and I were chatting about agents at a BBQ and we said “Why don’t we become agents and stick together and stand up for better pay and conditions for short actors?” Because short actors were almost viewed as a commodity – “How many do you want?”, that kind of thing. They were never looked at for their individual talents, just that they were the right height for the job. So we took action, and over the years the agency has grown – pardon the pun! We now represent over 120 clients, and have a division that represents tall actors over seven feet, and diverse productions that range from Harry Potter to commercials and pantomimes to nightclub work. It’s really rewarding getting people auditions and letting them know they got the part. You can change people’s lives financially and artistically, or even just boost the self-esteem of someone who has grown up shorter than everyone else and feels their career prospects aren’t that good. We had a lot of people on the latest Harry Potter films. It’s a rewarding business to have. We called it Willow Management because I thought the film Willow was very positive for short actors and short people in general. You’re working on the new Harry Potter movies at the moment, is that right? Yes, I’m working on the seventh Harry Potter until June. It’s really exciting, I play two different characters in those films. Harry Potter has been ongoing for the past few years. It’ll be sad to see the end of that. It’s something you almost take for granted each year – to have no more will be a bit strange and sad. It’s a comedy series, Life’s Too Short, which I’ve been working on with Ricky Gervais and Stephen Merchant. A BBC pilot has been commissioned, and Ricky and Stephen at this very moment are writing it. I couldn’t have wanted anything better could I? I play a version of myself as more of an egomaniac. I enjoy the fame, I’m quite pompous, my personal life is slightly altered and twisted – it’s a bit like Larry David in Curb Your Enthusiasm. How this all started, is that people have a certain perception of me as an actor. They think that a) I live in a massive house and might have some servants, and b) I am probably married and probably getting divorced. So I thought wouldn’t it be funny to say, you’re right, here it all is! That was the seed of the series. Back to one of the questions you said fans always ask you: will there be another Leprechaun movie? There might be. Somebody’s pitched an idea to Lionsgate… I often wonder if Lionsgate know what they’ve got in the Leprechaun franchise! Because they inherited it from Trimark, and made some sequels, but I don’t know if they’re in touch with the fanbase that are out there. Because I hear it daily… from emails, people in the street, this desire for another one. If I had the money, I’d definitely say I’ll make one! We should have a whip-round. All the Leprechaun fans could put money in a bucket to make another one. Finally, in Size Matters Not you frequently remind us that you weren’t in Time Bandits. You know you’re still listed as appearing in that film on IMDb? Size Matters Not by Warwick Davis is out now through Aurum Press.